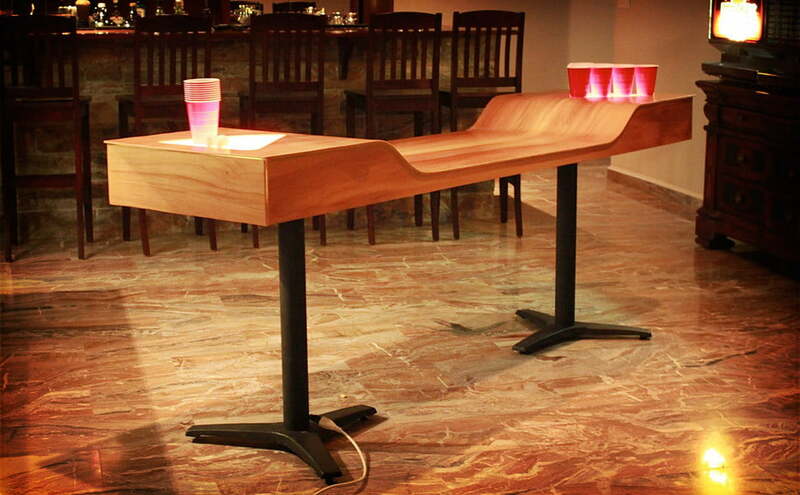 The Custom Beer Pong Table, need we say more? There’s no shame in feeling the urge to play a game of beer pong every once in a while with your friends. There is shame, however, in having a large plastic table set up in your living room at all times. The Custom Beer Pong Table ($750) solves that problem with a swanky design that is both aesthetically pleasing in a grown-up setting and conducive to beer pong games. The seamless poplar wood exterior, curved design, and light-up LED triangles on either end make this table seem like a lounge-worthy furniture piece instead of a frat-house essential. The legs of the table are dining-quality cast iron, and an on-off switch is mounted underneath the table. With no visible screws or seams, this sleek wood table would be perfectly at home in any modern living space and would work well as a buffet table for those less-raucus family gatherings.